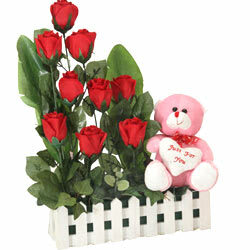 Convey your special wishes with this Breathtaking Nine Red Roses with a Teddy with Heart with Loving Embraces as you enhance happiness in the lives of other people. This is a Beautiful Arrangement of Imported Art. These are 9 Red Roses with a Teddy with Heart. The Flowers and Leaves are washable and can be enjoyed for months. Order this for a long lasting memory.